Welcome to CG Online Tutorials - This is Bryce 3D Modeling tutorial category web page and you can find link of a useful Bryce 3D modeling tutorials regarding Making Bottles in Bryce Part 1, hosted in other web sites. If you want to suggest a tutorial please do contact us, you can find our email address at the bottom of the web page. Here you will learn some basic considerations when creating your own bottles. You will see how the bottles were made in the "New Drink" image which should give the basics for making images with your own Bryce modeled bottles. 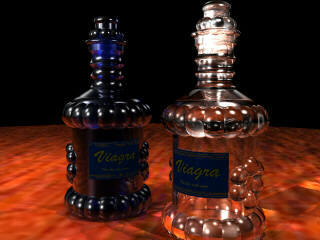 Keep in mind that any object that has reflection, refraction, and transparency will take a while to render. The more complex and the larger the quantity of them, the longer it will take.